It’s not often on Glee that we are introduced to the characters’ families. There are a few exceptions, sure - primarily with Kurt and the relationship with his father, Finn’s dynamic with his mother, and Quinn’s boomerang relationship with her own parents. But for the most part, the Glee clubbers are orphans for the purpose of the narrative - kids whose parents are mentioned offhand, but never really seen. Rachel, however, belongs to both these groups. Technically, she has had a major storyline devoted to her family; and yet we find that, much in the way that Rachel lacks any functional friends, she is also without functional family. Even though her dads are mentioned in Rachel’s character introduction in the Pilot, we have yet to meet the Fathers Berry, and they are therefore absent from Rachel’s sphere as we know it. Shelby Corcoran burst onto the scene in the Back 9, and effectively upended Rachel’s existence. Coach of the rival team, mentor to Rachel’s maybe-spying-maybe-not boyfriend, makeout buddy to Rachel’s teacher, she eventually revealed herself to be Rachel’s own birth mother. Cue a lot of angst. There are two large issues with Shelby’s arc. Firstly: there was not nearly enough time to develop it. I do actually commend the writers for handling it well considering the circumstances - it was appropriately touching, heartbreaking, and interesting - however, it unrolled slowly, and self-destructed quickly. Nine episodes we knew of Shelby’s existence. Four episodes we knew that Shelby was Rachel’s mom. And three episodes where Rachel was allowed to interact with Shelby, before she snatched up Beth and was gone forever. There really was not enough time devoted to it, which leads me to the second issue with Shelby’s arc on the show: it’s terribly tragic for Rachel’s character. 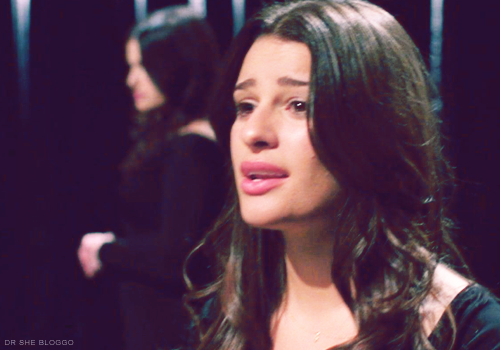 I can’t decide if it’s genius or heartbreaking in how the storyline interacted with one of the core identifiers of Rachel Berry’s emotional development. Let’s go with genius for now: here is a character whose arc on the show is about embedding her in a functional group, making her feel special by having her be a part of something special. What could speak to this notion more than family? This character is technically adopted, and an only child - she is, on paper, lacking the comfort and solace of a birth-given sense of belonging. So the show introduces her real mom, and establishes that this character, the daughter, needs a mother in her life. Here’s the girl’s chance to feel like she belongs - regardless of however much she loves her dads, the show specifically set up the idea that Rachel longs for a mother - for that sense of fitting in, of knowing where she comes from and where she belongs. And after four episodes, Shelby basically says she doesn’t really want a relationship with Rachel, but would rather have a new baby to start fresh with. And she leaves. Oh goodness, the heartache. The heartache! This is in direct violation of Rachel’s character development! Rachel is being deprived of a family, again! Rachel is being told she doesn’t belong, again! And that’s not to say that it’s not a worthwhile storyline to explore, but oh goodness, does it hurt. This is why I’m tempted to say that it’s genius - because Rachel’s mother actively denying her a relationship falls in step with the notion that Rachel is doomed to isolation in all areas. She is awash in a sea of functional relationships, repeatedly refused healthy interactions, friendships, and romances. But at the same time, the payoff was one of pure tragedy. It’d be one thing if, in an effort to balance the scales, Rachel simultaneously experienced acceptance from her fathers, or from the Glee Club as a whole - but instead, she was left unfulfilled by Shelby, and unfulfilled by the Glee Club. I mentioned previously that Rachel’s completely removed from the Glee Club’s sense of togetherness by the end of the Back 9 - she didn’t even go with the club to the hospital as they supported Quinn giving birth. Shelby’s rejection of Rachel didn’t allow for acceptance anywhere else, which is perhaps the true disappointment of the storyline. It was lovely that Finn told Rachel he loved her in “Journey,” but that moment existed simply for the purpose of the season finale wrap-up, and was framed in the furthering of Finn-and-Rachel, and not in contrast to Shelby’s abandonment in terms of Rachel’s character arc. So in some ways, it would make sense to bring Shelby back into the picture at some point, at least for some sort of emotional resolution. However, it’s difficult to say that just because Rachel’s character arc involves embedding her in appreciation, that Shelby has to come back and be a Good Mother Who’s Involved in Rachel’s Life. Tying down Idina Menzel is a logistical issue, and probably ill-advised. But if Shelby’s not going to - and that’s valid - then we need to see Rachel’s dads. It’s clear that the Elder Berries (hee) adore their daughter, thanks to their Basement Museum-Shrine Hybrid, and that divine portrait in their stairwell - but for the purposes of the show, they are absent from Rachel’s onscreen existence. Based on Shelby’s rejection and the sheer invisibility of her fathers, Rachel is almost a stranger in her own families, a character in isolation much in the same way she is in the Glee Club. And the point of her arc is to give her a true family, whether it be in Glee Club or in her own home - or preferably, both. If Rachel's family life is going to be developed any further, Ryan Murphy better start looking for Mr. and Mr. Berry - or at least a happier ending. People tend to bring up Carole as an example of an involved parent on this show, and she has appeared a decent number of times, but she's not been anything more than a prop (and a prop in Kurt's story, at that, this season, since all of her appearances revolve around Kurt) since the Back 9. Nowhere was this more evident than "Theatricality" and its non-aftermath, when she shows up in the first scene to act supremely irresponsibly and then vanishes. From the Blu Ray pilot episode commentary, Murphy says the reason he hasn't brought in Rachel's dads is because he doesn't think they could ever "top" the scene with their photo in the pilot. Sean C - I agree that Carole isn't as involved as she could be, and honestly Quinn's parents are basically ghosts as well. We really only have Burt as an example of a functional parent on this show. And, if you'll allow me a blunt opinion, I find Ryan Murphy's argument for not bringing Rachel's dads on the show to be BS. To me, that's a cop-out of a reason. Yes, casting men that aren't the ones in the photo could perhaps be problematic, but it's certainly not out of the question. The text is completely on spot. This is one of the most frustrating Rachel stories for me because I have always believed her relationship with her mother could be an awesome opportunity for the character and the series. This is a very lonely girl with no female figures in her life, not even friends. Meeting her birth mother could be a game changer moment for Rachel. But their relationship ended up in 3 episodes. What is the point of bringing this history up and disappearing with it so fast? I agree with you, the sadness of the situation could be incredibly beautiful and perfect for the situation. But, when the history was over, I was just mad about the sloppy way they deal with it. It didn’t felt like she was winning somewhere and losing in the other, it seemed she was doomed to be rejected by everybody. In the end, I think I was even sadder because I had really loved the introduction of this history in Dream On, but the rest felt incredibly rushed. It would be nice to bring Idina back and give this situation a little closure, but I won’t hold my breath. If they acknowledge Rachel’s feelings about the situation in anyway (maybe in an honest conversation with Quinn since they both have this connection) I would already be happy. Jen - thank you! I'm with you! I was mystified at the fact that a) they ignored Rachel's dads completely and made it so that Rachel NEEDED a mother and then b) ripped her away after a few episodes. What on earth. It makes me shake a fist at the writers, even though I appreciate the tragedy, in "I Dreamed a Dream" especially.